Last night I opened my diary from my travels in 1984 at Chaing Mai, 21st of June. I had forgotten all about the motor bike trip into the hills to visit the local indigenous tribe. Have you ever had that feeling when you are excited that you just want to do a little clap? That was me!! 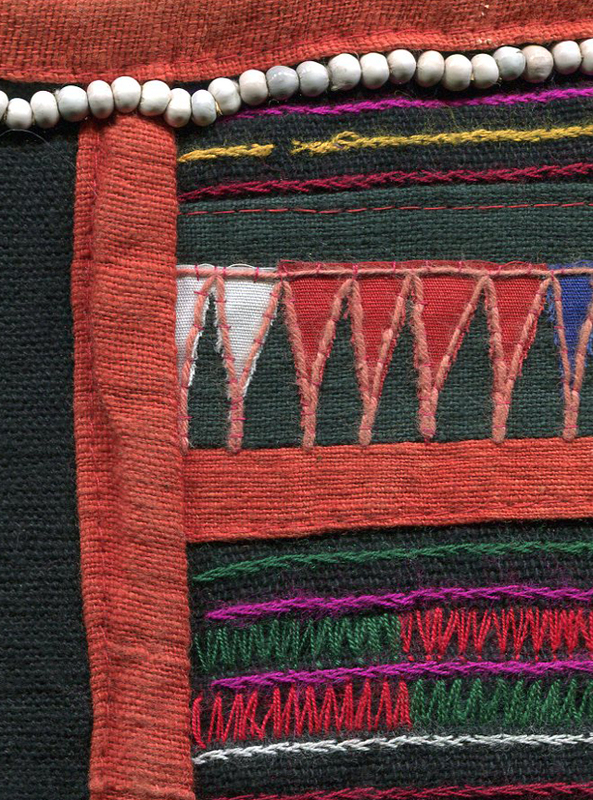 Textile heaven, exotic beyond belief and slightly dangerous ….. so thrilling. We stayed as paying guests of the Village Chief. 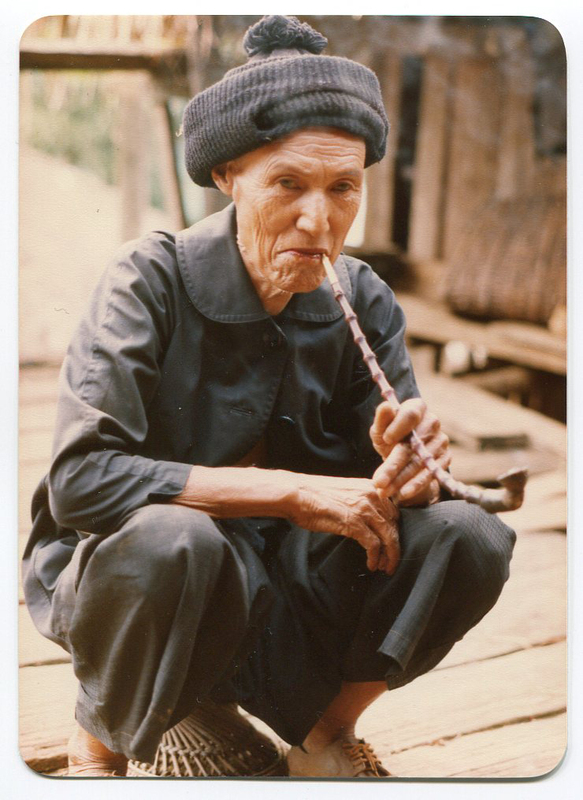 He was a wily old man who knew the value of his tribe to tourists. 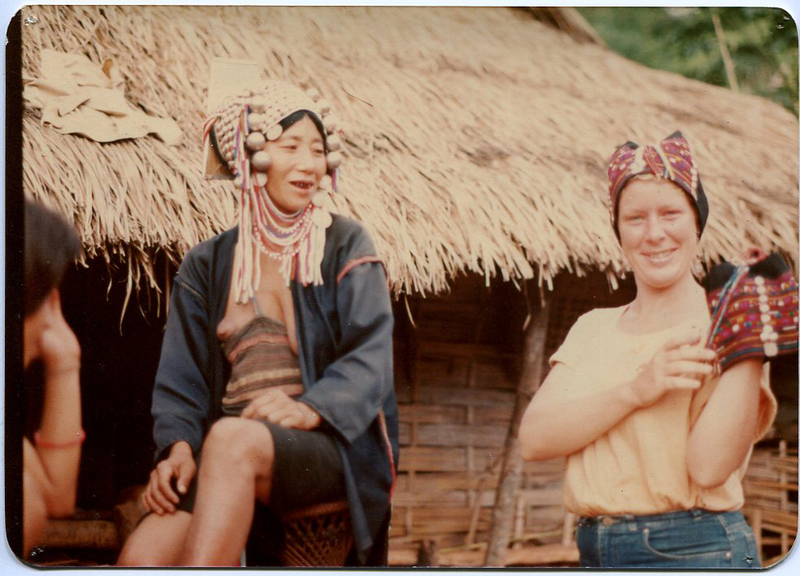 I was always troubled by the nature of the relationship between myself as a westerner and these exotic poverty stricken tribes people. “It was obvious that the tribes people didn’t like us very much, we were only there for the money we had. Uncomfortable feeling” I suppose I felt as much of a commodity as they did … fair’s fair! Posing in what turned out to be a Boy’s cap! Like many indigenous tribes clothing is one of the few expressions of personal wealth. 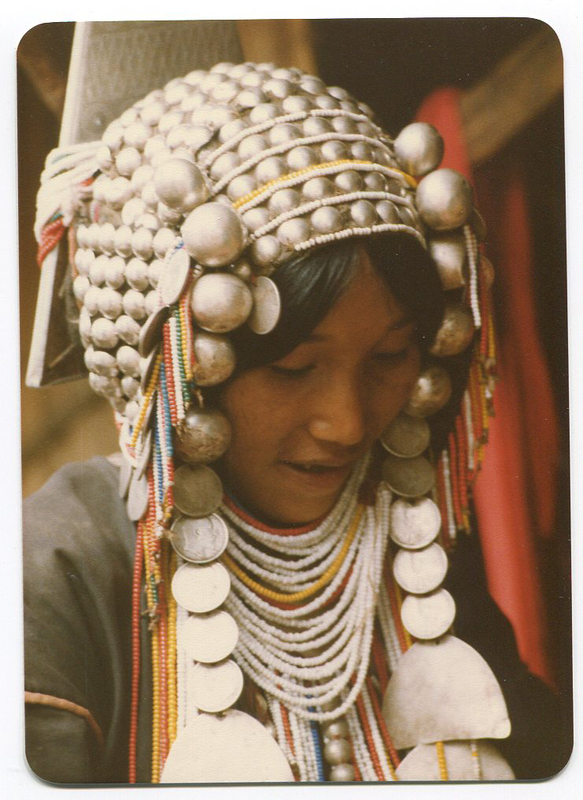 The silver head dress varies according to different Akha villages, they blew me away. I couldn’t help wonder how HOT and HEAVY it must have been under all that silver. 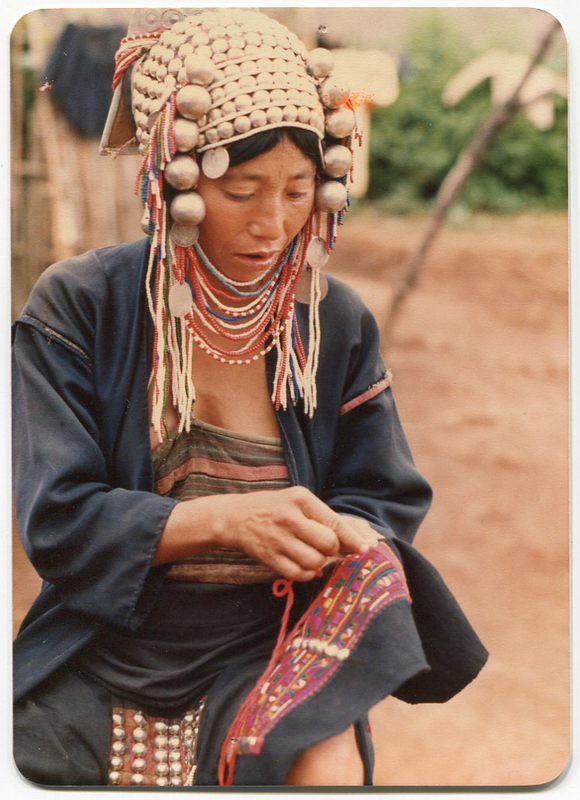 I wonder if there is such as thing as hat hair in the Akha tribes. 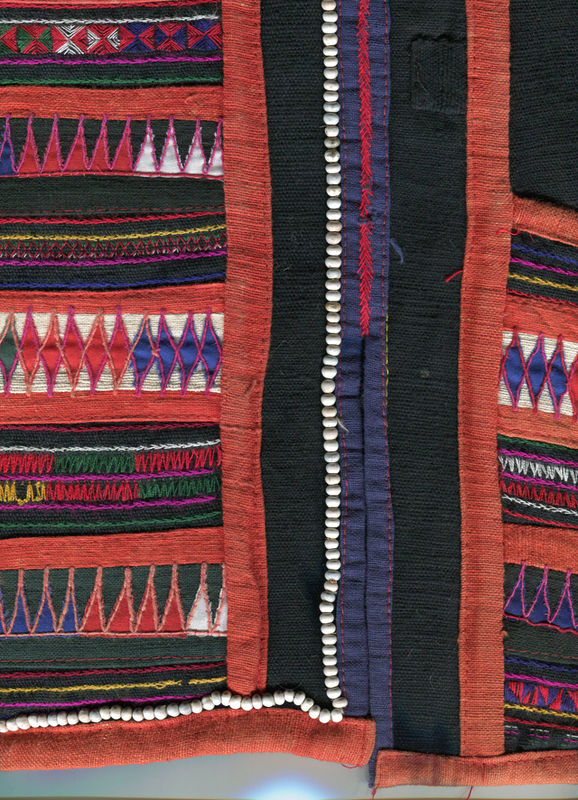 By 1984 the economy of the village was supported by selling the traditional embroidery. 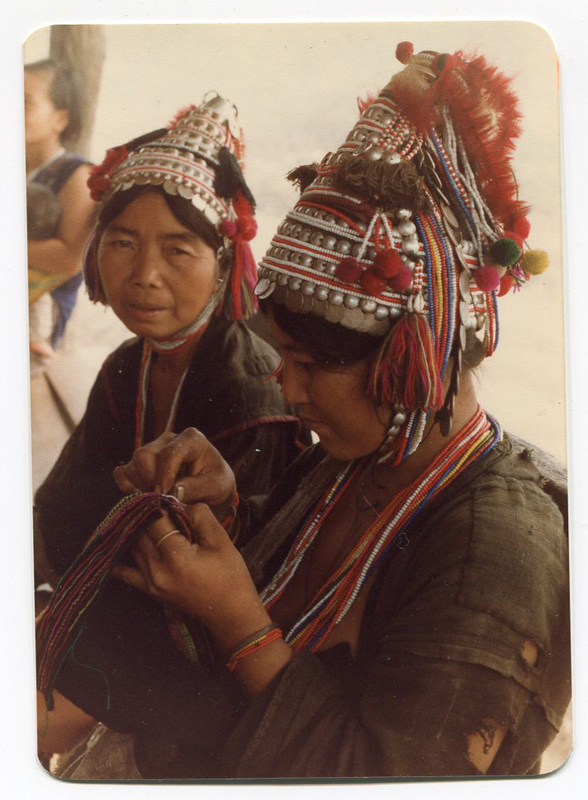 I felt empathy for the women because I knew how much work went into such amazing pieces ….. but not that sorry not to bargain for hours over the price of a jacket and be a bit mad with the chief of the village who charged us an exorbitant 50 baht for accommodation and food. I looked up the exchange rate for 1984, 20 baht to the dollar! …. Perhaps I had lost perspective. I didn’t take many photos but bought postcards along the way. Try as I might I just couldn’t turn the jacket into a fashion item when I returned home. 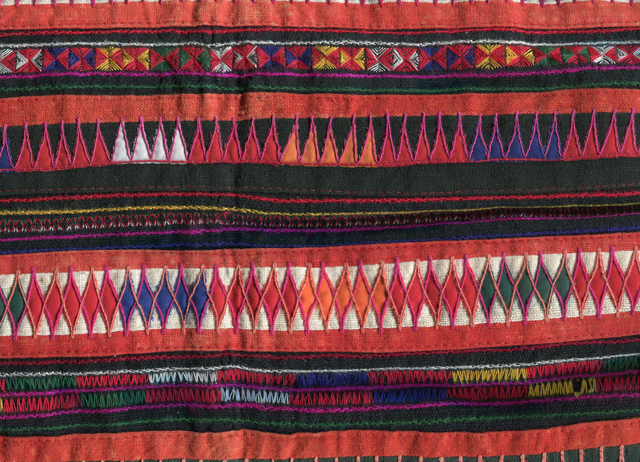 The Akha use tiny seeds to decorate the borders of the embroidered detail. 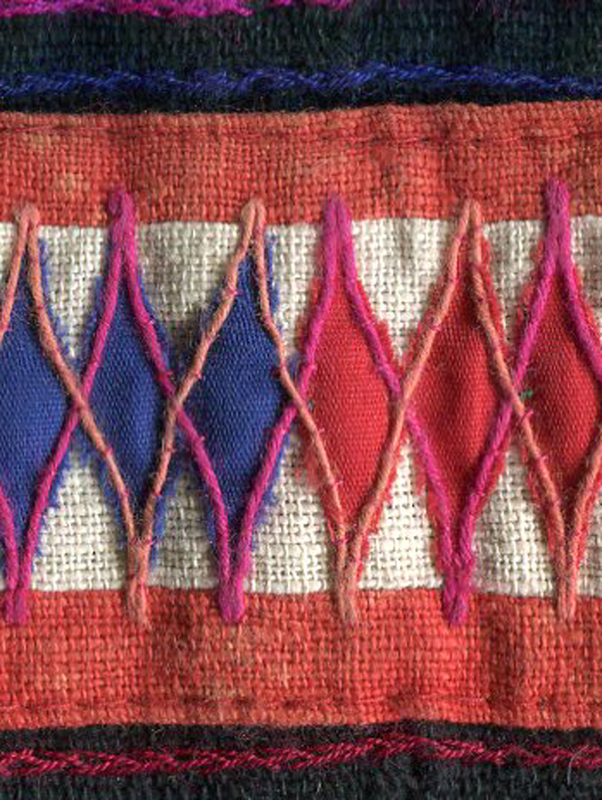 It’s a bit too hard to think about making that tiny detail, can you see that the applique is done with the couching method whereby the colored yarn outline is stitched down my hand …wow… soooooo much work, and I bet they didn’t have good scissors to trim the appliqued fabric back. 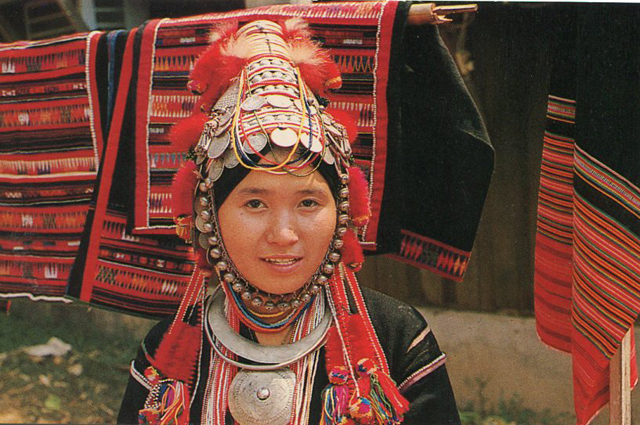 I bought a great book on the costume of the Hill Tribes when I was in Thailand, it’s still available online! 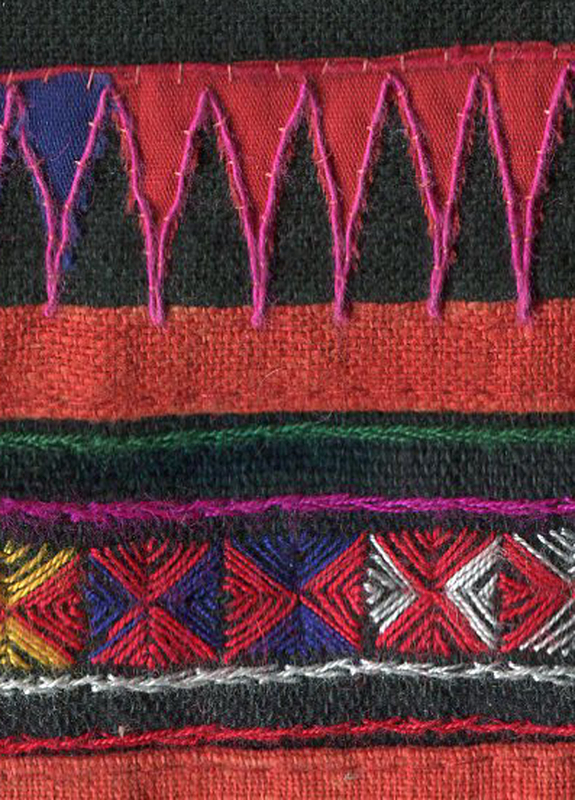 For those who are serious passionista’s of tribal textiles and costume here is a taste of what is in the book. ← Who knows what this is, what you do with it … and can you do it?